Mental discipline, two such simple and easy words. Mental discipline. Games 5 and 6 of the NBA playoffs demonstrated that the Miami Heat have a long way to go before gaining mental discipline. Understanding mental discipline is the Heat’s journey into a darkness of their own making. But on Sunday night, they got a lesson in this necessity in sports and life from Dirk Nowitzki, Jason Kidd and, let’s not forget, Jason Terry. Swagger is easy, mental discipline is difficult. It comes by releasing yourself to your heart and soul; it comes from giving yourself to instincts, trusting them — and trusting that the diverse others around you are feeling the same thing, experiencing things as you are inside the enabling constraint, discipline. In a fourth-quarter timeout, Terry said to Nowitzki, “Keep pushing. Remember ’06.” These are the tools of discipline; they involve knowledge of the self, leadership and an understanding of history. The Heat have no history; theirs is disparate, broken apart. They have histories. James, Wade and Bosh are individuals, not a cohesive whole. They looked lost when their eyes met, wondering who would drive to the hoop, who would take the next shot; who would lift them past the malaise. Their eyes told a story of confusion — and a lack of discipline. Sometimes, they confused defensive alignments. They were confused by the Maverick disciplined execution on defense and offense. In fact, the Mavericks gave the Heat a lesson on how defense is played in the NBA playoffs, particularly in the fourth-quarter in games 5 and 6. The Mavericks understood discipline and cohesion, where the Heat lived in chaos, as if children needing guidance. The Heat personified unknowing. The experienced adult won the NBA championship. Age beat brawn. When LeBron James left Cleveland, a darkness followed. He was embraced by the Gordon Gekko-like president of the Heat, Pat Riley. The Heat organization — and James — believed that by buying talent, an empire that could win championships would be forged and make history ad infinitum. This is an age-old story, a false history, a misunderstanding of history. What happened to the Greeks? The Roman Empire — anyone hear of the Fall of the Roman Empire? Anyone hear of the Empire of Illusion when referring to the American decline? Somehow James and Riley thought that they could exist outside history. We mortals, unfortunately, cannot. We mortals tend to repeat the mistakes of history, rather then learn from them. As I sat watching the Mavericks tutor the Heat, I thought about us, Americans; I thought about the state of us. I wondered, with an ironically named Corona (crown in Spanish) in hand, why hubris seems always to be the stalwart guide when what we need is a calm, slower and reasoned approach. We need discipline. It comes from understanding diversity, opening up to it. 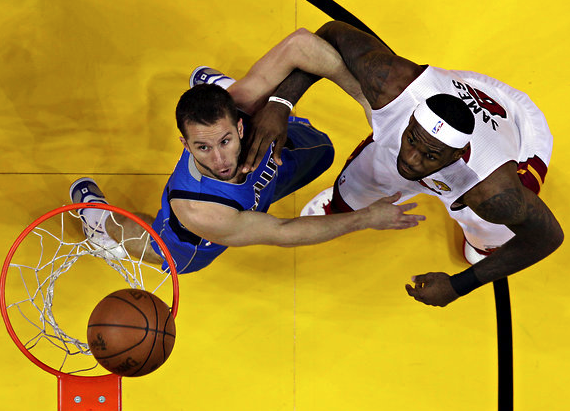 James ran into this notion when the diminutive J.J. Barea battled him for a rebound early in the game. Barea effectively boxed out James — a classic move young kids are taught as soon as the can shoot a basketball. The giant James forgot this, thinking that he could overwhelm tiny J.J. . What James didn’t know is that David and Goliath is always ongoing in history; it never ceases — rebels vs Gaddafi, the Egyptian Revolution, Rosa Parks. Can two events happen simultaneously in time? Yes, of course, and they can. Death, for instance, is always ongoing and we, the living, experience those that have left us in different forms, different ways of being. This is undeniable. Historical events, personalities — is Gordon Gekko Iago? — even thoughts, all of which create causes, leave a residue that revisits us in time. Our recession is being compared to the Great Depression. In many areas — education, the environment, and definitely in foreign policy, President Obama is following the policies of George W. Bush. Tragically, Obama is following Bush on matters of race, too. We are fallible, and it’s because we are that self-interest — “Greed is Good” — wins out over historical truths and we become blind and repeat the mistakes of the past. This is destiny. This is also how and why empires are always destined to fall. The fall is already present in the creation. Understanding entropy might help here. Ice always melts. Systems fall apart. Humans fall apart, age. What lives must die. LeBron James’ Gekko-like, Iago-like, dark decision of the soul to leave the Cleveland Cavaliers because management there couldn’t build an empire around him, is pregnant with decay. Decay is ongoing. While James must have felt that the Cavaliers were at their end, the end — the seed of decay and endings — now germinates in the Heat enterprise. It comes, first, in the form of fear and anxiety — the notion of ending a career without a title, which Bill Rhoden expresses so well in his post game article, “Two Veterans Finally Access an Elite Club.” Rhoden says that not reaching that NBA title ring is a “haunting gap” on the athlete’s psyche, his résumé. 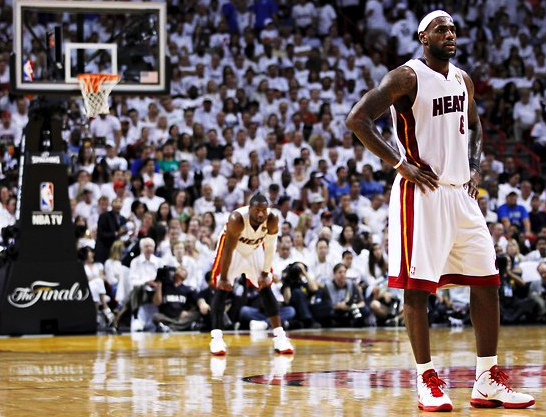 James’ move to Miami is the fear of this “haunting gap.” A fear such as this one can be debilitating, which is what we saw in James’ — and the Heat’s–performance once they reached game 5. They broke down. Even on television you could see the fear in James’ eyes. He was paralyzed, as was the rest of the team. The fear in James’ eyes, we’ve seen before. We saw it in Tiger Woods’ comeback, for instance. We see it now in Obama’s second bid for the prime seat of power as he tries to “Win Back Wall St. Cash,” only, sadly, Wall St has never left the White House or politics, suggesting that it’s irrelevant who sits in the White House (Obama or Mitt Romney) since it’s Wall Street and the corporate class that run government, politicians their foils — a marked return to the Roman Empire of there ever was one. The fear in James’ eyes is our very own, too. It is the exhausting, paralyzing fear we feel as we look around at the world. No matter how one may feel about the “evil empire,” Miami, and LeBron James, secretly, we wanted them to win. We wanted to see James victorious because in doing so, it would have meant that history doesn’t repeat itself; that history is not fraught with failures we repress and repeat; that even with our fallibility, we can somehow move forward and secure our luxurious futures by expending large amounts of capital to buy it. But, of course, this didn’t happen. The only hope left is that we might reflect on the meaning of this event in our lives, the meaning of the narrative of James and the Heat and the stalwart Mavericks (not surprisingly, the team is lead by an old German!). This entry was posted in cultural studies, Dallas Mavericks, LeBron James, Media, NBA, philosophy, Pop Culture, sport in America by hector. Bookmark the permalink. Now i’m from Germany and now we are certainly proud of Dirk Nowotzki. A German born is definitely a star in the choicest basketball league around the world. We are happy how the Us americans celebrate “all of our” Dirk. This is probably significantly less recognized in the united states.